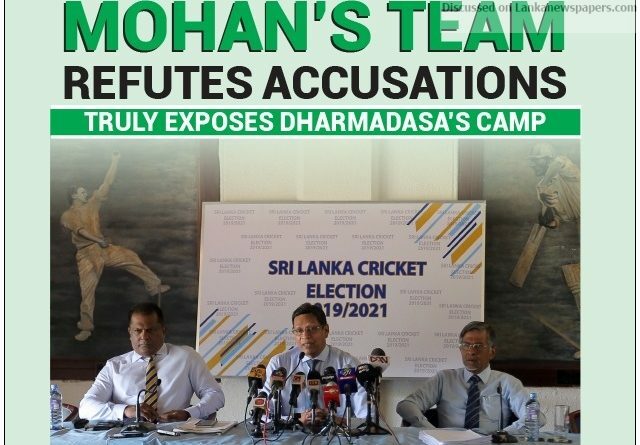 Mohan de Silva and his team challenged his rivals who are levelling baseless allegation at them, which is in preparation for the forthcoming Sri Lanka Cricket (SLC) elections scheduled to be held on 21 February, at a press conference held at the Gymkhana Club yesterday. He thanked the Sports Minister for giving them an undertaking that he would play a very impartial role to ensure a free and fair election. He further stated that his team had had a very cordial discussion with the Minister relating to a number of issues connected with the administration and the lifting up of the game, and commended the Minister for agreeing to do a forensic audit to determine the true situation of the Board rather than making unreasonable statements, which would have severe repercussions and a negative impact on the game, the institution and the country. Mohan who is in fray for the Presidency of SLC was confident that they are in a strong position and are gaining momentum in their campaign day by day. He revealed that Jayantha Dharmadasa and his alliance who are struggling to grab votes even after offering thumping amounts of money to the clubs, are trying to cook up stories and mislead the Sports Minister and the public of this country. All allegations and objections that Jayantha Dharmadasa filed against them are baseless and have no credible evidence to prove that they are true. Whilst emphasising on these allegations, Mohan revealed that their rivals are targeting them with 2001 and 2005 gazette notifications issued by the Sport Ministers’ in charge at that time. One notification in 2005 was under Minister Jeevan Kumaratunga, stating that the losses incurred were due to the mismanagement of the governing body. But Mohan explained that those were done with malicious intent just to bring Jayantha Dharmadasa through the back door, when they had signed a lucrative deal with Ten Sports for US$ 52 million for marketing of Broadcasting Rights for three years, which was the highest recorded so far. This was done in a highly undemocratic manner by the then Minister of Sports flouting the process as laid out in the Sports Law, thus violating all forms of natural justice. This not only prevented Sumathipala and his Team (who were uncontested) being officially elected by the Membership, but paved the way for Dharmadasa to get in through the back door. Thereafter, Dharmadasa had renegotiated the Ten Sports agreements after six months and entered into a new agreement with two new addendums, extending the period for three more years, but for a much lesser value than agreed earlier. Mohan claimed that he had complained to the then President Mahinda Rajapaksa about this massive fraud and his Secretary Lalith Weeratunge had acknowledged receipt of the letter and confirmed that an inquiry would be held. However, he claimed that it had been swept under the carpet, but Arjuna Ranatunga had taken the same matter up with Minister Gamini Lokuge when he was the Sports Minister and he had appointed a three-member Committee of reputed and eminent people to investigate, and this Committee had found Dharmadasa and, Mathivanan guilty of misappropriating millions of dollars. Subsequently, the Minister who took over thereafter had cancelled that notification which became null and void. He said a similar situation has occurred in 2015 under their rival’s tenure in office. Later the incoming minister had cancelled the gazette notification. Therefore, it clearly shows that these notifications are inactive and the allegations are baseless. At the time when they took over the management of SLC, it was a debt ridden organisation. Even the staff salaries had not been paid. Under former President Thilanga Sumathipala they worked hard and managed to turn tables and clear all debts and turn it around to make the institution a profitable one with a net surplus of over 2 billion rupees. Mohan further said that there is no one in his team with tainted backgrounds, and no one is convicted or on bail for criminal offences. Only those who have crooked minds look at others with crooked eyes. Mohan was very confident that they would win this election with a huge majority.